As the cold winter is here, Visit Yosemite Madera County is encouraging people to get out and enjoy the winter activities in Yosemite National Park, Bass Lake and Madera County to keep your blood pumping and to beat the winter blues. Experiencing Yosemite and Madera County in what some call the most magical of seasons, winter. This season offers breathtaking beauty, loads of fun and few crowds. Enjoy snow in the high country with tubing, snowboarding, sledding, and ice-skating. Relax at beautiful snow-covered Bass Lake while you snuggle up with a steamy beverage next to a crackling fire. Yosemite Ski & Snowboard Area has it all and makes it easy—from getting here to renting equipment to taking lessons. You’ll find groomed trails perfect for cross-country skiers, chairlifts that take Alpine skiers to the top of the runs in minutes, a challenging terrain park for snowboarders and skiers to test their limits, and a tubing area where the whole family can experience the thrills together. 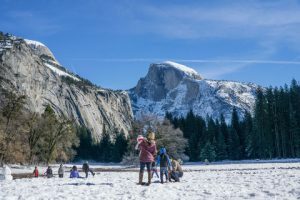 For a full list of winter activities, check out our website yosemitethisyear.com or call 559-683-4636.